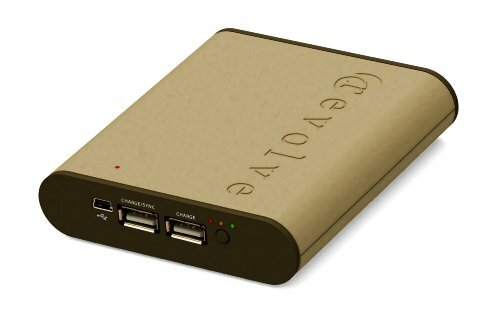 The xe4400 hybrid charger combines the ability to charge from multiple sources with a powerful internal lithium battery backup and two high-powered USB power outputs to provide portable power for over 3,000 mobile devices, like iPad, Galaxy Tab, iPhone, Galaxy, BlackBerry, EVO, Droid, Kindle, iPod and more at home or on the go. Perfect for travelers, busy professionals, students, or anyone that needs the freedom and convenience of an all-in-one power source. The xe4400 charges itself and your devices directly from the wall outlet or external power source, while also storing extra power inside of it's internal battery to recharge your devices anytime, anywhere. Plus, the xe4400 is made using Revolve’s exclusive Electronics®, which offer unique features and utilize advanced materials and processes that are all designed to enhance sustainability and minimize impact on the environment. Plugs directly into the wall, replacing existing chargers for multiple devices. Long-lasting 18Wh (4400mAh) internal battery provides up to 8 hours of extra use time on the go. Plus, the internal rechargeable battery is replaceable! High-powered 2.8Amp DUAL USB output charges up to TWO of your devices and the internal backup battery at the same time (including iPad, Galaxy Tab, Kindle and more)! Battery status indicator displays the amount of power stored in the battery. DC 5V USB charge input for recharging from car adapter, computer, or other external source. Features proprietary wood-plastic composite materials made from recycled plastic and bamboo fiber. If you have any questions about this product by Revolve, contact us by completing and submitting the form below. If you are looking for a specif part number, please include it with your message. Axis, T8008 Ps12 Power Adapter Ac 115-230 V 85 Watt "Product Category: Ups/Power Devices/Power Adapters (Other)"